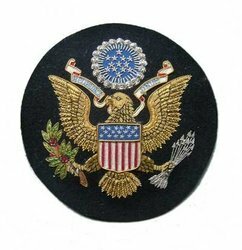 We are the reputed manufacturers of Coat Arms Badge that have been made from the best quality raw materials. These are highly appreciated by our valuable clients. The Coat Arms Badge that we provide have been made from the best quality material that is procured from reliable and dependable vendors. They have detailing of specified embroideries that have been stitched from good quality threads that are silk in nature. We ensure grand piece as the technology used is that of the latest. Our clients are impressed by our techniques and have placed their order in bulk. Looking for Coat Arms Badge ?